How are we able, in fact, to walk the way of the Cross? It is because ultimately we are walking towards the Resurrection of Jesus Christ. We walk along with Jesus on his way to Golgatha and experience much with him, but it is because we ultimately experience him in his Resurrection that all of this has meaning. We sing great alleluias because He is Risen, not because he has died. This Sunday has been called Palm Sunday for many centuries even though the story really is about the Passion and Death of Jesus Christ. Our celebration of the Blessing of Palm is distinctive to this Sunday and it is the grand introduction to Holy Week with all its profound and spiritually moving ceremonies and services. How fitting it is to begin this week with a Procession of Palm in honor of Jesus Christ and his ultimate victory over death. Note that the first two readings of this Sunday are the same every year. Their purpose is to make the passion and death of Jesus Christ their principal focus. Our Old Testament passage from Isaiah identifies clearly the sufferings of one servant who bears the burden of pain for others. The wonderful book of Isaiah contains four sections titled “Songs of the Suffering Servant”. 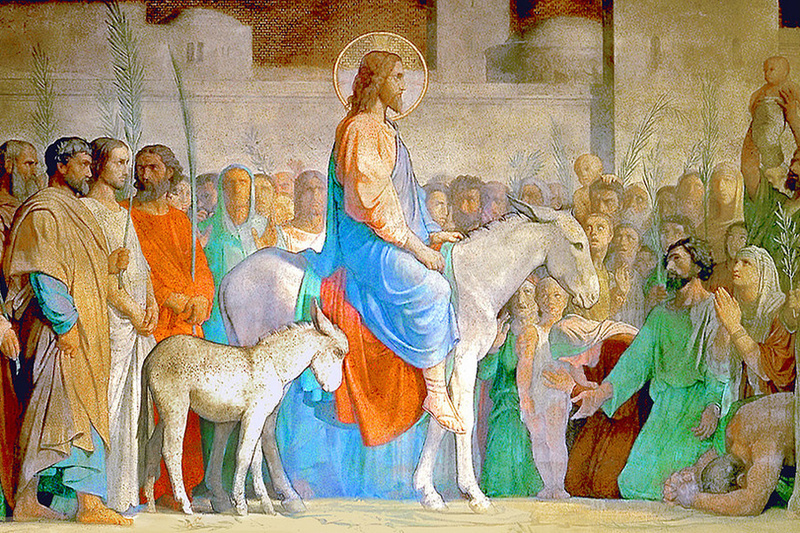 On Palm Sunday we read from the third song. This reading provides a connection between the song and the story of Jesus’ life. We all can hear Jesus saying these words, as he describes the events of his public ministry as none other than a school of compassion. Bear in in mind that every day he had given himself over to his mission, no matter what the threatening consequences. This magnificent Song of the Suffering Servant prepares us to read the great Passion story. The passage from Paul’s letter to the Philippians offers us a balancing perspective to our first reading. It is an adapted hymn that gives us an image not only of Jesus’ life and death, but also of his resurrection and exaltation as Lord. This hymn from Philippians helps us to feel deep within us the power and poignancy of the Passion story itself. We know that each Gospel writer contributes various facets and details of Jesus’ passion and death. In the Gospel of Luke, the cross is the cause of our conversion, and this story highlights for us all the people along the via dolorosa, at the foot of the cross, and also at the cross itself on Golgatha. We learn in today’s reading of the wide and various assembly of people, both named and unnamed, who meet Jesus on his journey to his death. At the beginning we encounter Simon from Cyrene, who is pressed into service. He is the one who carries the cross for an exhausted and worn out Jesus. Jesus also pauses to speak to the women of Jerusalem for whose future he weeps as much as they weep for his. In addition, there are the women who were with him during his three-year ministry. They watch at the foot of the cross, but are at some distance. Luke writes about the good thief, repentant at last, and also the unnamed multitude who regret this crucifixion. We cannot forget about the centurion who realizes a great deal a little too late. Recall this quote: “This man was innocent beyond doubt” (Luke 23:47). And at the end, Joseph of Arimathea steps forth, offering to lend a tomb for Jesus’ body.